In the days leading up to Christmas, we will be running a series of posts featuring 12 great arrangements from Bloomex to make your Christmas season a little more festive in 2013. Happy Holidays everyone! For the first installment of our 12 Days of Bloomex Christmas we'll have a look at our Classic Christmas Centrepiece. 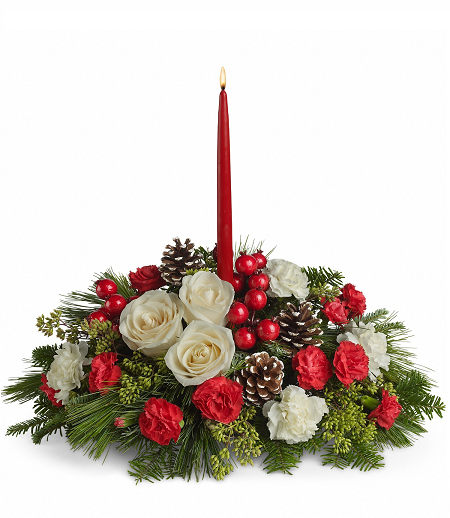 This arrangement consists of a large red candle, adorned by Roses, Carnations, cones, various greens, Gerberas, ribbons and floral foam in the container to keep the arrangement fresh for as long as possibleIt makes for a lovely addition to your dinner table during the holiday season and brings a little Christmas cheer to any room. Please note that the candle colour may vary. Check out the product page for this centrepiece here. Join us tomorrow on the Bloomex blog for the second installment of this series! This arrangement consists of a large red candle, adorned by Roses, Carnations, cones, various greens, Gerberas, ribbons and floral foam in the container to keep the arrangement fresh for as long as possible. It makes for a lovely addition to your dinner table during the holiday season and brings a little Christmas cheer to any room. Please note that the candle colour may vary.